The application has to collect the choice from the customer so to route the call to the appropriate queue. 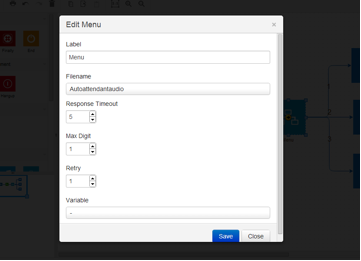 In the following picture you can see how the menu box can to be configured, in order to make the application working as described. 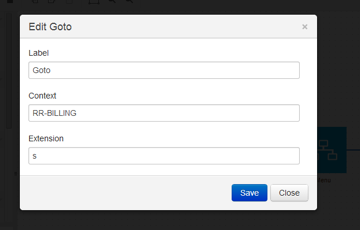 The GoTo box routes the call to the RR-BILLING context. 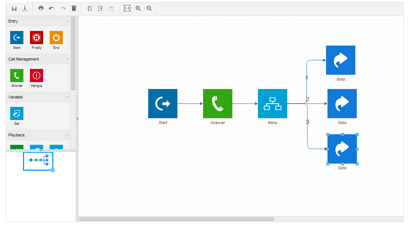 In this context you can call a queue, embed a new IVR, route the call to a fixed extension, or proceed in your Asterisk dialplan as you prefer. In the following picture you can see how the GoTo box has to be configured in order to make the system working as described.